My friends know that I am a fan of The Walking Dead. I read the comics, I’ve stood in line to meet Robert Kirkman, I have a Rick Grimes Funko Pop in my office (the TWD wall calendar I was given one Christmas was deemed NSFW), and I wear Walking Dead cosplay when I go to cons. And being a gamer, I play Walking Dead games. Most of the Walking Dead games I have experienced have disappointed me, being mediocre at best, or requiring an intense competitiveness I don’t possess just to keep my head above water (I’m looking at you, Road to Survival). The Telltale games are wonderful, but once the story’s over, it’s over. There was no game to help me get a daily Walking Dead fix. Darryl leads the Terminus survivors to a camp. 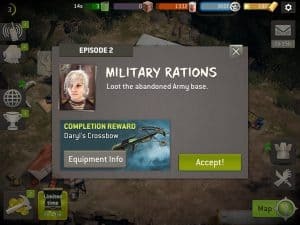 About a year ago, I discovered The Walking Dead: No Man’s Land. You may have seen this game advertised while watching the show on AMC (it is the ‘official game’ of the television program, not to be confused with the ‘official game’ of the comics). 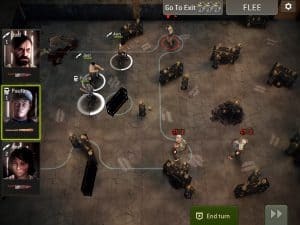 I found No Man’s Land as it was in its infancy, barely a couple of weeks old, struggling to make a mark in the mobile game market. 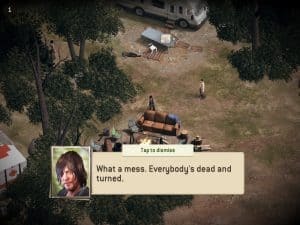 AMC was only giving tentative support to the game back then, although the prestigious license included an image of Darryl on the game icon, as well as Norman Reedus’ voice and image used through many of the cut scenes. But Next Games, the small studio that produces No Man’s Land, held on and worked with the players, making many revisions and upgrades, transforming the game into something of which they can truly be proud. They marked their first birthday earlier this month with a week of great events celebrating the game and its loyal players. No Man’s Land begins with a small group of survivors who find themselves caught in the madness of Terminus as it burns to the ground, with walkers everywhere. 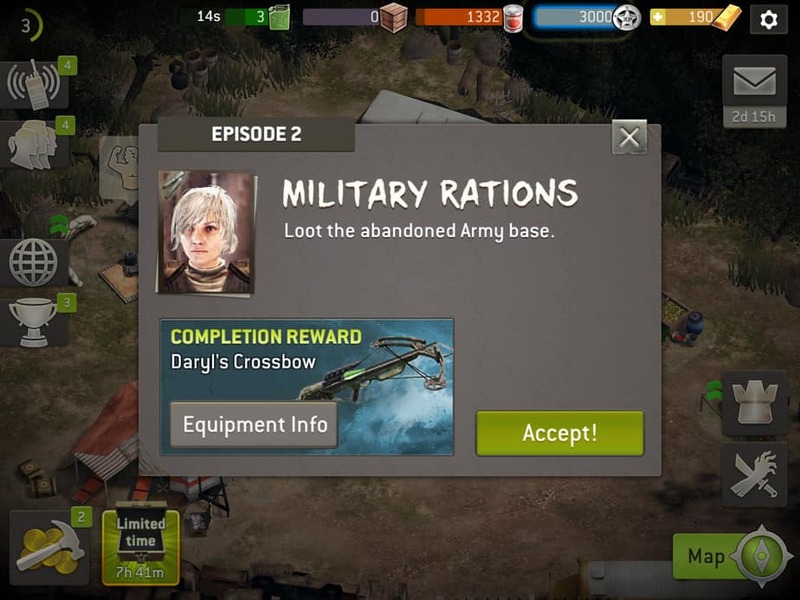 Fortunately, Darryl and his crossbow are on hand to give them a few tips, and assist in their escape. After a few missions and some close calls, Darryl even joins their ragtag band. They set up a camp, but the story doesn’t stop there. 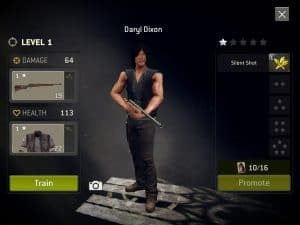 They have to recruit new survivors, train them up to higher levels, and upgrade their gear. They need to grow food to expand their camp, and find gas to fuel their mission car, to allow them to move further and further from camp in their explorations. Along the way, they hear rumors of a mysterious haven named Eden, where people are safe. Is it too good to be true? All they can do is investigate. Survivors fight their way through Terminus. No Man’s Land is primarily a player vs. environment (PVE) game, where you develop your team of survivors to battle both walkers and humans. 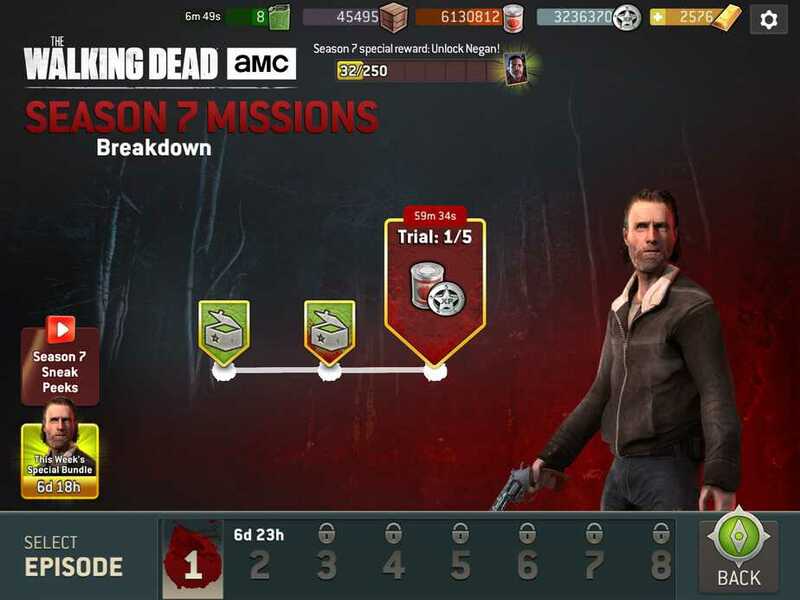 There is an optional social element in the formation of guilds, where teams of up to 20 players can work together each week on a new set of challenges (many of which take place at in-show locations, such as The Slaughterhouse, Terminus, Herschel’s Farm, and The Hilltop) to earn rewards for everyone in the group. For those who enjoy a player vs. player (PVP) experience, there is the option to create an outpost of your camp, which can be found and attacked by other players, while you can raid those other players’ outposts for valuable trade goods and influence. These three elements (missions, guilds and outposts) permit players to interact with the game in multiple ways, as much, or as little, as they would like. No Man’s Land is a ‘freemium’ game, allowing ‘free-to-play’ users to make their way at a reasonable pace through the game, while those who wish to show their financial support have a small advantage in progression. I have found the balance between playing ‘free’ and ‘pay’ to be very reasonable, and there is no feeling that you are being forced to spend in order to enjoy what No Man’s Land has to offer. Once No Man’s Land got its footing and proved that it wasn’t just a flash in the pan, AMC got behind it, allowing the addition of other Walking Dead characters into the game. In addition to Darryl, you can now add Rick, Michonne, Glenn, Maggie, Carol, Abraham and Jesus to your camp, although to do so takes a lot of time and effort. Obtaining one of these heroes for your camp feels like a victory, as it should! AMC is also working with Next Games to tie in content from the television show directly into the game, keeping No Man’s Land fresh and relevant. 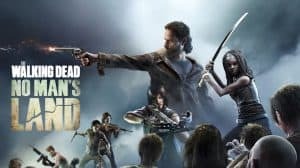 A big update is expected right around the time of The Walking Dead’s season 7 premiere on October 23rd, which will include direct references to the show… enough that representatives from Next Games refuse to leak details, on the grounds that it would violate their non-disclosure agreement with AMC. 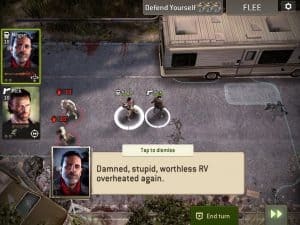 If you’re a fan of The Walking Dead and enjoy mobile games, you owe it to yourself to give The Walking Dead: No Man’s Land a try, on iOS or Android devices. 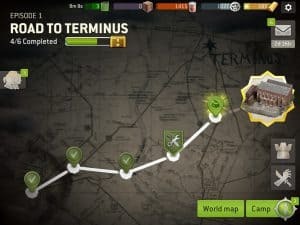 Do you play The Walking Dead: No Man’s Land? Join the conversation on FoCC! No Man’s Land was featured on the December 4, 2016 episode of Talking Dead, the live after show for The Walking Dead program on AMC. It seems that Chris Hardwick has created a special survivor nam,ed Rufus for No Man’s Land. Rufus, inspired by Hardwick’s great grandfather, is a solitary man who lives alone in the mountains. He gets excited every time he gets new visitors to his mountain farm – too bad that most of them are dead. Rufus has a moonshine distillery in his mountain cabin: it turns out that jars of moonshine make a handy bottle bomb weapon to greet visiting walker! No Man’s Land has now been updated to version 2.2, and the most exciting aspect of that update was revealed this morning, when a new series of ‘Season 7 Challenges’ became available to players. 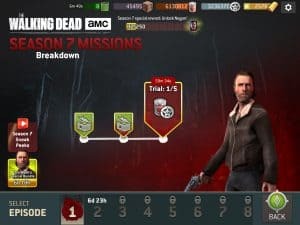 Every week, the game will feature a new challenge directly related the most recent episode of The Walking Dead (as aired on AMC in the United States). The challenge is considered to be a ‘deleted’ scene, featuring characters and locations from each episode, but not directly spoiling the contents. 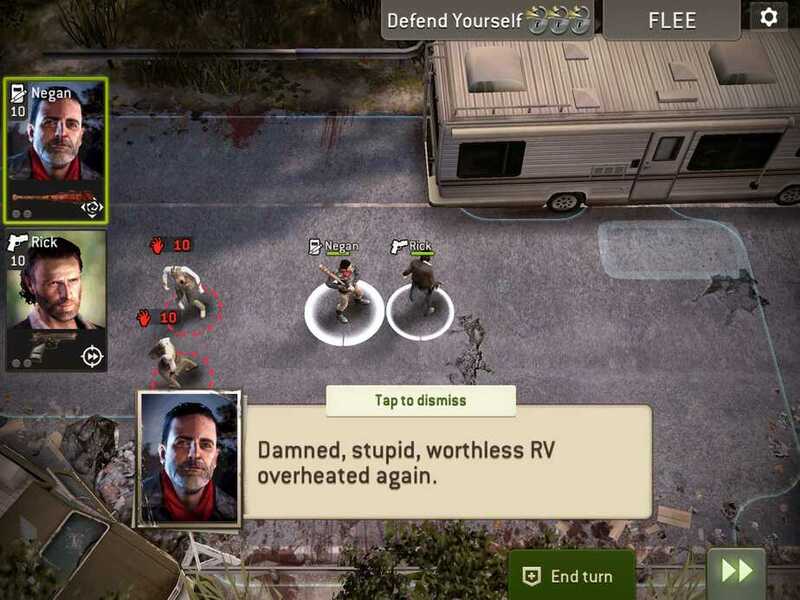 The first challenge released this morning features Rick and Negan fighting off walkers outside of the RV (which has broken down). Best of all, if players complete all eight challenges (one for each episode during the first half of Season 7) then they will unlock the character of Negan to play in the game. I am very much looking forward to adding Negan to my roster of survivors! Are you excited about the new Season 7 challenges? Join the conversation on FoCC!